Viktor "Isildur1" Blomille suuret swingit high-stakes käteispeleissä ovat tuttua kauraa. Vuonna 2009 Blom nousi julkisuuteen ilmiömäisesti kohtaamalla muun muassa Tom Dwanin, Phil Iveyn ja Patrik Antoniuksen muiden ohella ja voittamalla miljoonia ensimmäisinä kuukausinaan sivustolla. Hänen tosin väitetään hävinneen kaikki rahat takaisin — suurin osa tappioista tuli verisessä heads-up taistelussa Brian Hastingsia vastaan. Blom on kokenut samankaltaisia swingejä tämän vuoden alussa. Aloitettuaan vuoden voittamalla yli $4 miljoonaa tammikuun ensimmäisellä viikolla, Blom on hävinnyt lähes kaiken takaisin. Tällä kertaa Blom on siirtynyt tutuista ja turvallisista no-limit hold'em ja pot-limit Omaha käteispeleistä mixed gamesien pariin haastamaan niiden veteraaneja. Blom on lähes keltanokka kyseisissä peleissä mutta hän on silti ansainnut maineensa yhtenä pelottomimmista pelaajista nykypokerissa. 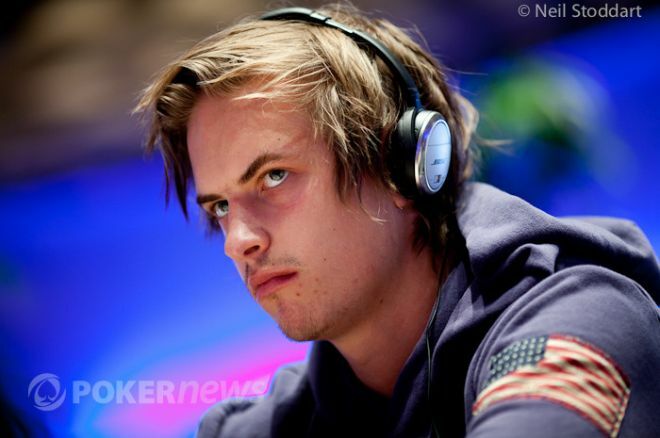 Ensi viikolla Blom tulee osallistumaan heads-up haasteeseen Bertrand "ElkY" Grospellieria ja Team PokerStarsia vastaan osana European Poker Tour Lontoon pokerifestivaalia. Ennen matkaamistaan Grosvenor Victoria Casinolle tällä viikolla, Blomilla oli hetki aikaa istua alas PokerNewsin kanssa juttelemaan high-stakes peleistä Full Tilt Pokerilla, siirtymisestä mixed gamesien pariin ja muuta. Haastattelu julkaistaan kokonaisuudessaan englanniksi. You made a name for yourself playing the high-stakes games at Full Tilt Poker a few years back. How does it feel to represent the site where "Isildur1" truly became a poker superstar? Full Tilt Poker has always had the biggest high-stakes games, so it just feels normal and natural for me to play there and be a pro there. It feels right, like I should be there playing more than any other site. You left your sponsorship deal with PokerStars shortly after the company purchased Full Tilt Poker last year. Did you part ways with PokerStars so that you could be a part of FTP? No. The timing of the end of my deal came right at the time of Full Tilt being bought by Stars. FTP was where I made my name, so I think it just fell into place that I came here when my contract was over. I need to be on the side with all the high-stakes action is, so that helped. Did you always want to be a sponsored pro at FTP? I made a lot of money early in poker, so of course freedom sounds better to a poker player. I also didn’t want to go looking for any attention; I just liked to play. But now I get that it’s not bad to get a few live event buy-ins and get to travel the world while I play, too. If I had a choice of sites, I’ve always chosen Tilt. At this time last year you were known primarily as a no-limit hold'em and pot-limit Omaha player. Lately, you've playing more mixed games and 2-7 triple draw. Why the switch? No one will give me enough action at the other games, so I have to learn new ones. If games at no-limit hold'em were better, and there were more good games, I would still play them any day. Last year you had just started learning mixed games before taking 14th place in the $50,000 Poker Players Championship event at the WSOP. Have you been studying and improving simply by playing those games or do you have someone teaching you along the way? When I played the Poker Players Championship, I didn’t know all the games. Daniel Negreanu gave me a quick lesson, and I tried to go after a cash. I was very happy cashing in that event, and I ended up hitting a one-outer in the pot for the chip lead during the tournament, so anyone would be happy then right? How do you feel you match up with some of the top mixed games and 2-7 triple draw players? Do you already consider yourself one of the best at the highest stakes? I enjoy the game and I'm still learning. I don't see myself as a top player yet, but I believe I will be some day... hopefully sooner than later. What do you like most about 2-7 triple draw? The game is a lot of fun, even though right now it is very expensive. Talk about the first few weeks of 2013. You decided to skip the PCA — and not to defend your Super High Roller title — in order to play online, and ended up making around $5 million before the end of January. Describe what it's like to win that amount of money in such a short time. It was a great rush for me, it always is. But I ended up losing most of it back, so I will have to try to do better next time. You've run into a bit of a downswing lately. How do you pick yourself up from a bad run? I usually go out and drink in town with friends and try to forget poker exists for a night, and then try again tomorrow once I am feeling better from the night before. At EPT London, you are going to compete against Bertrand "ElkY" Grospellier during “The Professionals” vs. Team PokerStars matchup. Gus Hansen decided to pit you against "ElkY" instead of Ike Haxton. We know you have a history with Ike, but who would you rather face off against? Ah, this is a really tough one for me. Ike is tough as hell. I would say "ElkY," but I’m not sure. I think playing with "ElkY" could be a lot of fun, even though I have no idea how he plays. That helps make it more fun, but this is still a tough one to answer. Can we expect to see you at the World Series of Poker this summer? If so, what events do you plan on playing? Yep, I think I’ll go. I haven’t decided for how long yet, and to me it’s too bad it’s right in the summer because that is when all the fun happens in Sweden.